10 years of development have resulted in the most advanced gas scooter launched to date. This “X’s” design has been developed and refined to be as tough as it is functional, making it one of the most versatile PTVs on the market. Whether used for daily commuting or extreme riding, the “X” will handle any terrain with the greatest of ease. 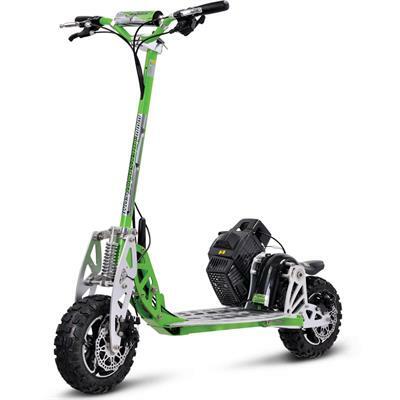 The “X” uses newly developed cross tread stability tires, the patented 2-speed gearbox and the auto locking fold up/fold down design, making it as easy to maintain as it is to ride for any novice or veteran adventurer.